The art of mastering surfski paddling is in learning to balance. The ocean is never flat and even on the calmest days there are bumps out at sea or waves breaking on the shore. Balance is absolutely crucial to your performance, whether you’re a novice or a pro. It’s really simple, the better your balance the more power you can put into each stroke and the better you will do in any condition. How does this relate to the paddler’s “Core”? Your core comprises abdominal stabilising muscles, which when used effectively, form the basis of one’s balance. Working on your core can directly help your balance in the boat. The core doesn’t help with paddling technique but can help you maintain posture and – working on it can get you up a grade at the next race series albeit with a bit of effort. Core strength comes in especially handy on the longer races where it can really aid you in that 2nd or 3rd hour of the race when you’ll still be efficient when others are falling apart. How do you use your core - specifically in a surfski? When your surfski goes over or down a wave, hits a bump or chop, it tilts from side to side. This is totally normal. You can control the ski by pushing with your heels. If the boat tips over to the right, tense your left leg against your heel to bring the boat upright and vice versa. This control of the boat with the legs (and specifically the heels) is overlooked by many paddlers who often have the boat set up with the wrong leg length or are pushing too hard on the toes. Make sure the boat fits perfectly; if it’s too short, you will be crunching up your stomach making your core ineffective and if it’s too long you will have no base to push off to bring the boat upright. Eventually when your balance is good you should be able to roll the boat around comfortably using the control of your heels. The core is what activates the legs and connects the balance muscles in the leg to the power muscle in the upper body that you pull with. HOW TO STRENGTHEN YOUR CORE? While there is a major trend towards more core exercises in athletes, there is commonly a misunderstanding of the difference between abs/stomach exercises and core exercises. The core is deeper and takes a little effort getting to. Sit ups won’t cut it. The idea is to activate your stomach muscles from different angles straight after each other to simulate the boat being at different angles under you when you paddle. Start by lying down on your back with your legs straight and do 5 crunches. 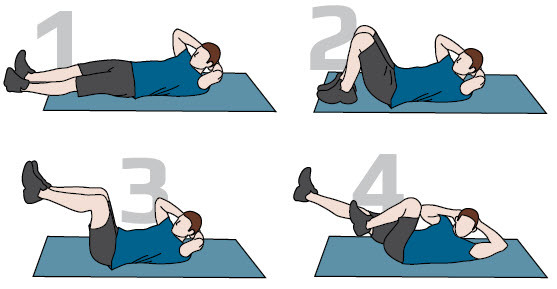 Lift your legs so your feet touch your bum and do another 5 crunches. Lift your legs in the air so your knees are at 90 degrees and do another 5 crunches and lastly 5 twists which include touching your elbow against your opposite knee while your feet do bicycle rotations. Start with these 20 repetitions, but as you get stronger you can build them up until you can do at least 20 in each position. The variation between the different positions is key - try not to rest between each of position. 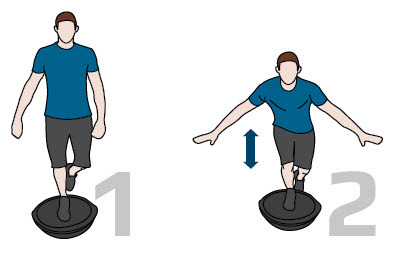 This will activate the top half of the body simulating paddling. Place your hands on a half ball and your feet on a full ball. Balance just as you would in a boat while holding your core nice and tight. Then do push ups and don’t stick your bum in the air – try to clench your bum to keep your back perfectly straight. Start with 5 push ups and slowly build up to 20 push ups as you get stronger. 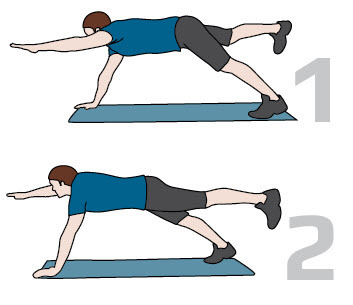 Start in the push up position and lift one arm and the opposite leg until they are parallel to the ground and level with the rest of your body. This will stretch out your upper and lower body and force you to balance with your core rather than compensate with any other muscle groups. You need to hold this for 15 seconds and then do the same with the other side. This will help you use your core to focus and push down on the heel as you would in a boat to control its roll under you. The back leg can go directly back behind you. Do 10 reps on each leg at a time while focusing on using your core and hips to bring yourself up straight. This is super hard and takes practice. Have someone help you to start and don’t fall! 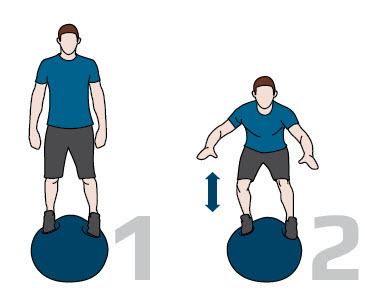 Use a railing (or your training buddy) to help you get up so that you are standing on a big ball. Start by trying to let go and balance on your own by tucking in the stomach and using your feet to control the ball below as you would control the boat. When your confidence improves then do 5 squats at a time holding onto something and then try doing 5 squats with free hands. This is to simulate the twisting motion in the body that occurs in the boat. 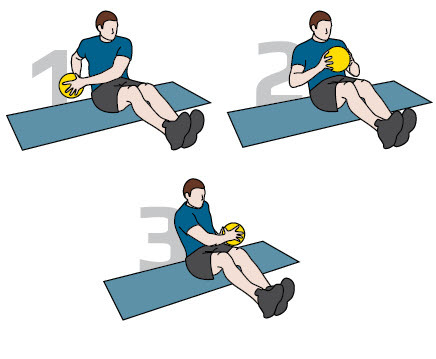 Sit on the floor with a small medicine ball in your hands. Lift your feet off the ground and rotate the ball from side to side over your body so that it touches the ground at your hip on either side. Start with 20 rotations and build up gradually so that you do a full minute at a time. This is the most famous core exercise. Start in the push up position and then drop to your elbows. Keep the back straight by pulling in the stomach and tightening the bum. Hold this for as long as you can and build up so that you do a full minute at a time. This article appears by kind permission of Barry Lewin and Sportsguide Magazine. Barry is professional surfski paddler and runs the Durban branch of the Varsity College Surfski School. He's also been instrumental in sponsoring developmental paddlers in KwaZulu Natal and the launching of the inaugural South African Interschools Surfski Championships in 2010.